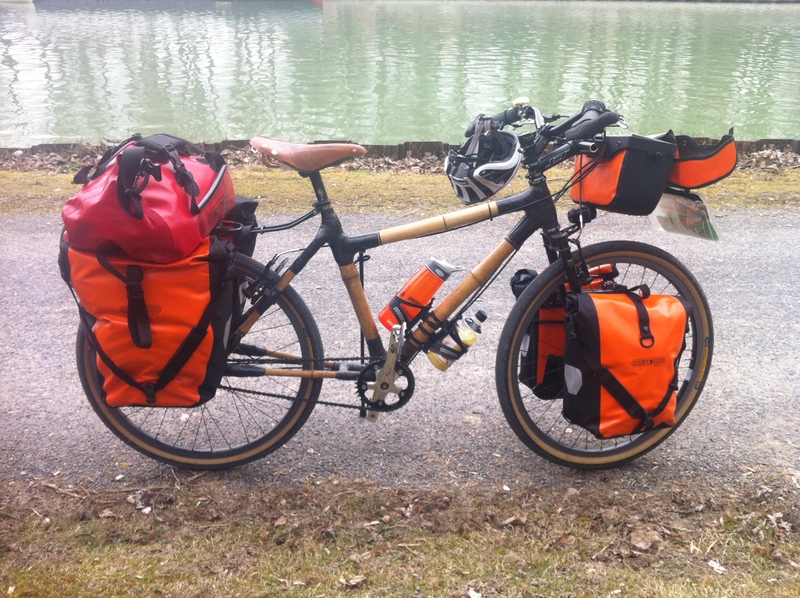 The final product….the perfect expedition touring bikes? So to start at the beginning, we built bamboo single speed bikes @ Bamboo Bike Studio (Brooklyn- sadly no longer operating) and loved them so much, that we could not consider doing this half-world journey on any other kind of bike. You may or not be familiar with the joys of bamboo frames, but if you are not they are ecologically sustainable, easily customisable and great fun to build. We could not easily afford to get a high quality custom geometry frame in steel but in bamboo its cheap and easy and best of all provides a comfortable ride. Bamboo is super strong, more so than reinforced concrete, lighter than steel and vibration dampening…which are all desirable in an expedition frame. We used bikeCAD, a freeware program that lets you play with geometry, the very well equipped jigs and tooling of Bamboo Bike Studio NYC and copious amounts of Redhook’s best coffee to craft our custom expedition frames in 2011. Fast forward a couple of years. Due to Li’s Dad’s brain cancer, we were able to save and buy the choice components we wanted, often at half the retail price….So what are we riding half way across the world? Custom long wheel base bamboo frames fitted out with Rohloff 14 spd internal gear hubs, Rigida tungsten carbide rims, Tubus luggage racks and beloved Chris King headsets… a bit of bling to accompany us on our long journey…and almost 12 months into the trip the bamboo has performed flawlessly, the Rohloff’s have only needed 2 oil changes and everything else has just kept going, along with our legs. 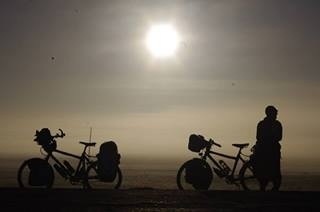 Seven punctures combined in almost 26 000kms (combined) and we believe we have the panacea of expedition touring bikes. And a note to all you bike junkies out there: the bamboo was harvested in Mexico, but almost anything will do, if it is relatively large & even diameter. The lugs are a composite of marine grade epoxy resin and carbon fibre roving. The strength of the lug depends on the wrapping pattern. We built these frames in less than 48 hours and they are super tough. 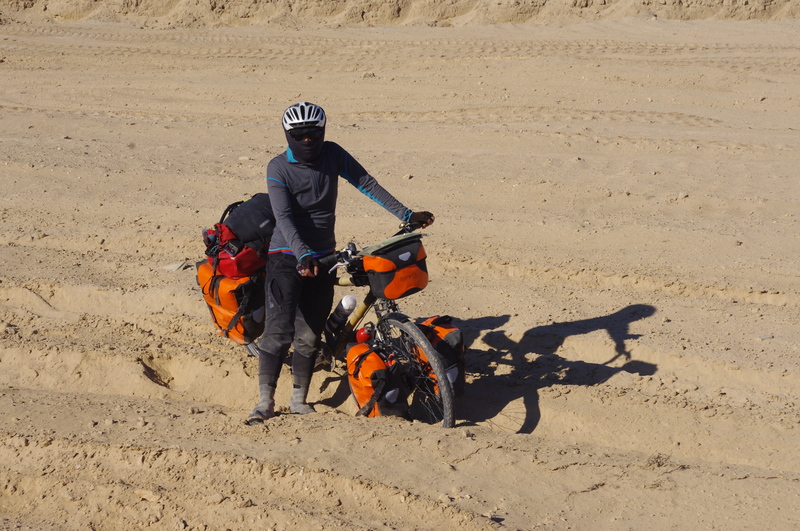 We regularly carry 35 Kgs each plus water and food totalling up to 50 Kg and the bikes have never failed. 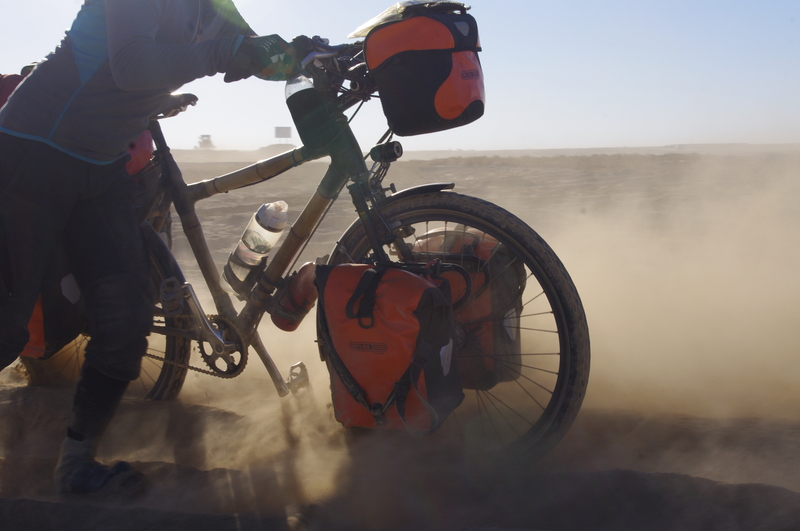 Our legs have come close on mountains, but the bikes are dependable. Almost 13 000kms so far, and they have been treated pretty badly, constantly outdoors, come rain or shine, -16- +48C, on the occasional bus or boat (think 40 Kgs on luggage ingraciously piled atop, plus the occasional fowl or goat) and the frames are as true, as the day we built them. With bamboo, we don’t need to stress about dings or scratches…Jules the cabinet maker calls it ‘patina’. If you have any questions on building your own dream bamboo bike, please shoot us an email. 8 Responses to "Our Bike Build"
Hi, LOVE your bikes! I grow bamboo and have often wondered about its use for bikes. Is the bamboo you used in making your bikes heat treated prior to use, or treated in any other way to prevent it from cracking? Was it ‘green’ (fresh) when you used it, or aged (dried naturally) if not heat treated? Was the wrapping of the frame to prevent the resin adhering to places other than to where it was supposed to go? Thanks for the great photos and enjoyable read! If you come via Canberra , Australia drop me a line if you need a place to crash. From an old cycling tourist. great memories le and so inspiring you to are my heroines! It was great to meet you two!!!! Have a blast on the road!!! Hey you two. Really sorry I missed the off set. However I’m going to keep a daily eye on this site and I mean that. If there’s anything I can do to help please shout…and I mean that in EVERY way. This is a FANTASTIC blog!!! !